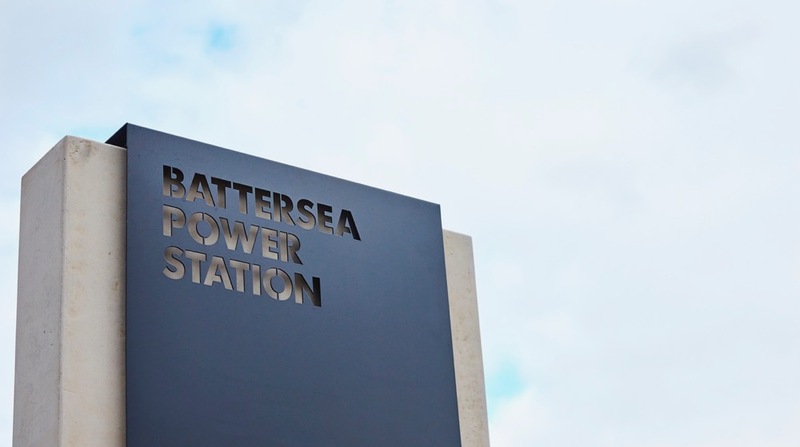 The regeneration of the Grade-II listed Battersea Power Station is one of London’s most eagerly anticipated developments and the completion of Circus Village West has not only attracted property investors in their hoards but also foodies from both the South and North of the river. The reason behind this gourmet influx is that the developers have only invited small independent chains to open in the riverside complex, creating a hotspot of diverse restaurants that pride themselves on original concepts with high quality food. 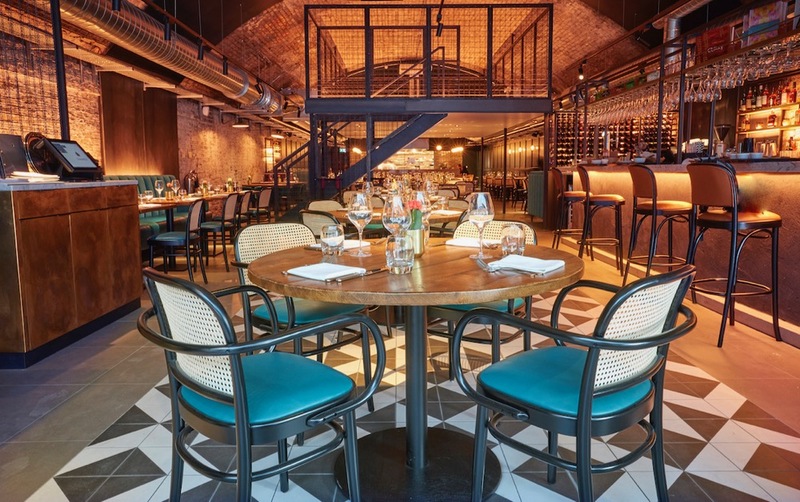 The Cinnamon Kitchen Battersea is the third Cinnamon Kitchen restaurant from Vivek Singh and his talented brigade of chefs and offers a relaxed alternative to the well-known formal style of the founding restaurant, The Cinnamon Club as our luxury London expert Laura Shelbourne finds out. 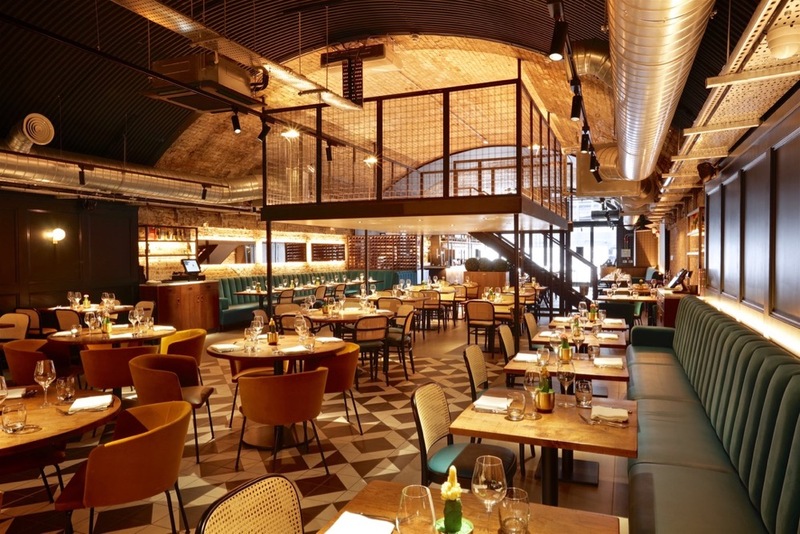 Each Cinnamon Kitchen has an original concept and the arches below the Power Station where the restaurant is located, lend themselves well to the Pink City Express train journey from Mumbai to Jaipur that has inspired the Battersea restaurant. The décor of the restaurant reflects a bygone era of train travel. Mirroring on the walls with clever lighting mimics train carriage windows whilst wooden panelling reflects Orient Express style travel, amplified by the gentle rumblings of the trains that travel overhead heading to and from Victoria, the original departure point of the famous train. 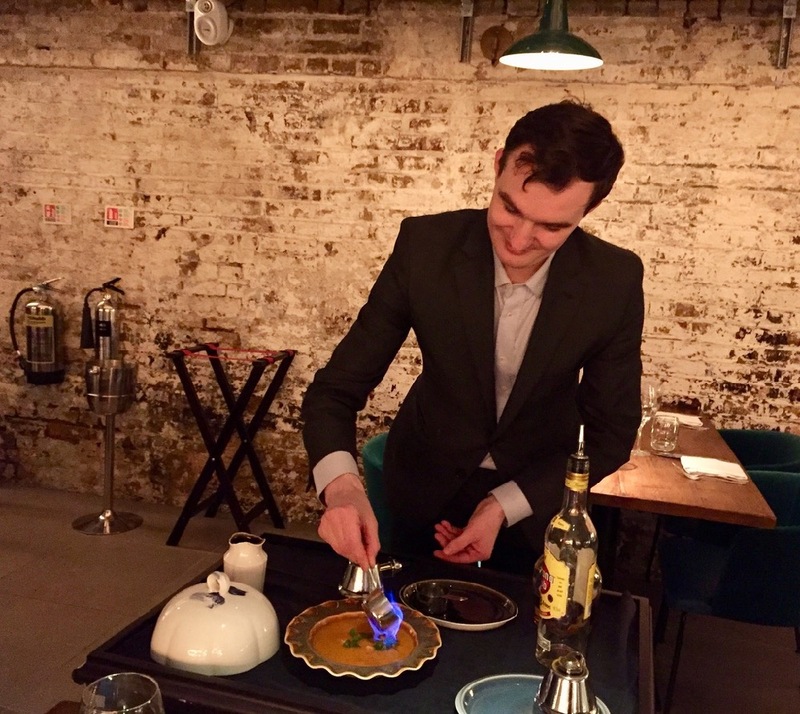 There is a well stocked bar as you walk into the restaurant, a great place to warm up and try an eclectic range of Indian inspired cocktails and prepare for the journey that awaits. The menu continues on the theme of the journey through India focusing on the specialties of the area. Divided into appetisers, grills, mains, sides, breads and desserts, it lends itself very well to the sharing concept. We decided to weigh our choices more heavily towards the small sharing plates and go for a lighter main. 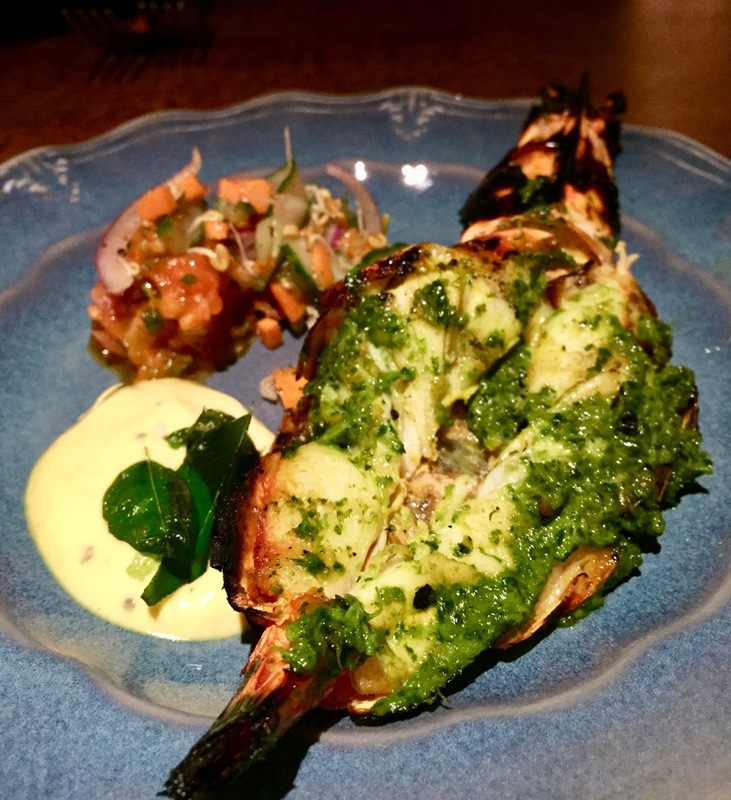 The Wild African Prawns are magnificent, presented so beautifully it seemed almost a shame to eat them, however the succulent meat blended well with coriander, yogurt and turmeric and the mild spice was offset with a refreshing tomato and cucumber relish. The Pink Aubergine has fantastic texture enhanced by the sesame, peanut and cucumber crumble which was matched well with slightly sweet mango and tamarind sauce. We were recommended the Keema Litti, based on a recipe from the chef’s mum. 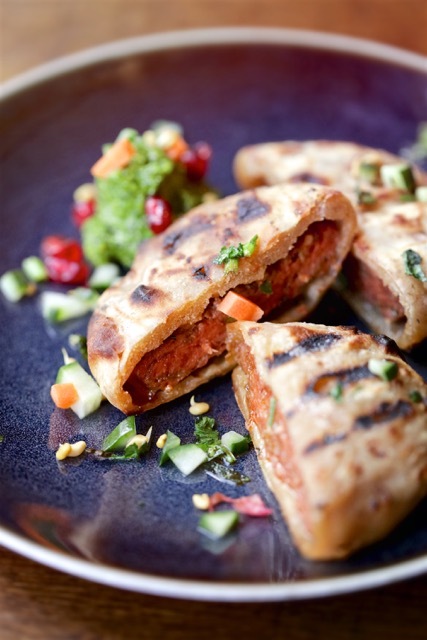 Tasty and tender well-spiced lamb is wrapped in Indian bread and served with a raita of cucumber, pomegranate and carrot to temper the spice of the meat, it’s delicious so hats off to chef’s mother. The great showpiece of the appetisers menu and one of the dishes that has been taken from the original Cinnamon Club is the Kerala Spiced Lobster Soup. Wheeled in on an elegant trolley, the soup is flambéed at the table with cognac. This velvety soup is scattered with prawns and pepper and coriander adds subtle heat and flavour. After such a splendid selection of smaller plates we opted for the Char-grilled Pollock as a main dish. Whilst not arriving at the table in all the glory of the Lobster Soup, the presentation of this dish is impressive. The vivid colours of the yellow lentil sauce with the fresh pomegranate, carrot and kale salad create a rainbow on the plate with the pot of gold being the beautifully cooked fillet of fish enhanced with a bitter mela chutney and mustard seeds. We ordered a trio of lentils dhal that was smokey and spicy and plain naan bread to accompany the dish. Make sure that you don’t jump off the train before the final stop and leave room for desert. The Sticky Ginger Toffee Pudding with Garam Masala Ice Cream is incredible. 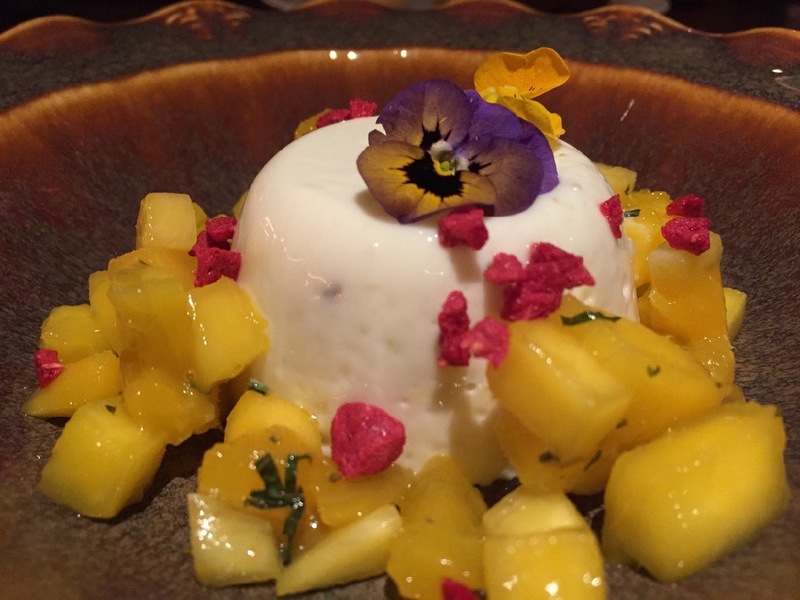 The Lassi Panna Cotta is also a fantastic option for those wanting a slightly lighter end to their journey, this dish is complemented well with refreshing mango and mint and crunchy air dried raspberry. 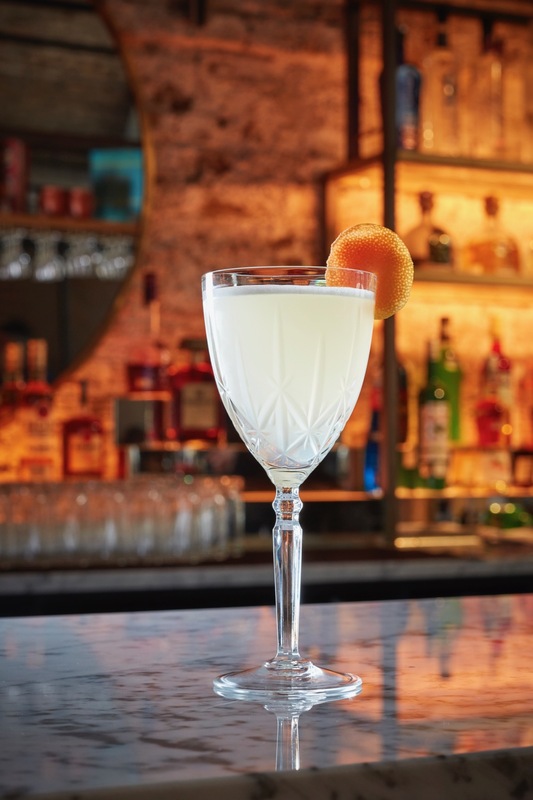 It is definitely worth exploring the Cinnamon Brasserie cocktail list; Indian inspired drinks are served in elegant crystal glasses infused with an inspired variety of spirits and spices. We tried a Mango Sour, where the sweetness of the mango and rum breaks through the sour lime in a delightful flavour combination. The Indian G&T is also recommended where the fenugreek matches well with aniseed. There is an extensive wine list is with a good range of prices. For a white wine the Vino Verde from the South of Portugal is slightly sparking and very dry with hints of citrus and gooseberry and it carries well with the strong flavours. For red we opted for the strong Zinfandel from the Lodi Valley, a full bodied wine full of berries and enough punch to compliment the spicier dishes. It is also worth sampling the desert wines. The Cinnamon Kitchen represents good value with appetisers ranging from £6.75 to £17.50 and mains from £14 to £29. Laura Shelbourne has worked in the luxury travel industry for over 20 years. She has journeyed extensively around the world and dined in some of the world’s most spectacular settings, a gourmet dinner in the sand dunes overlooking Uluru and breakfast in the African bush are amongst her favourites. Laura lives in London and is our expert on the city.